Debby Suchland, retired Troy R-III staff member, was named the Missouri Retired Teacher Association Region 13 Distinguished Retiree for the year 2017. This award highlights the volunteer work of MRTA members who have given service beyond the call of duty. 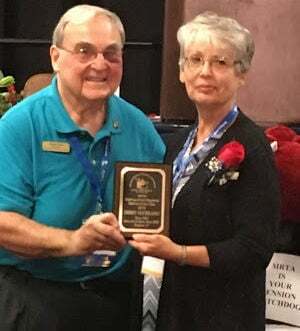 The award was presented recently at the MRTA Annual Meeting in Jefferson City. Representing the Lincoln County unit of the Missouri Retired Teachers Association, Debby has a personal motto of “Do small things with great love,” which is not an altogether accurate description of her selflessness as the things she does should not be described as small. In her community, Debby writes grants and works with local organizations to raise funds for her church to provide backpacks filled with supplies for underprivileged children. They then give these backpacks out at a carnival-like event for the children and their families. Last year, they hosted over 1,000 attendees. Debby has also served as the membership chair for her local unit and has created a cookbook for the unit to help fund classroom grants. Congratulations, Debby! Once again, the Lincoln County Area Retired School Personnel has received the MRTA Unit of Excellence Award for its activity on the local and state level. The Lincoln County Area Retired School Personnel Unit represents retirees from the Silex R-I, Elsberry R-II, Lincoln R-III and Winfield R-IV. LCARSP is a unit in Region 13 that represents Daniel Boone (Warren County), Lincoln County, Pike County, and St. Charles County. We are an active group, feel free to join us.